ASOS offers a wide range of products and services at incredibly low prices in Australia. These ASOS promo codes expire soon, so don’t forget to bookmark this page now. ASOS free delivery offer: Order ASOS T-Shirt With Crew Neck In Dark Green and Dark Blue colour and get a discount of 17%. ASOS free delivery offer: Order clothing, accessories, shoes and t-shirts worth $40 or more from ASOS and receive free shipping. New ASOS discount: ASOS offers a discount of 10% for all the students. So what are you waiting for? Shop now! Latest ASOS promo code: ASOS is delighted to offer French Connection Grey Tonic Suit with a huge discount of $106. Latest ASOS promo code: Purchase gunmetal finish, chunky band House Of Harlow Bangle with Howlite Stone and save $74. Exclusive ASOS voucher codes: Buy ASOS Maternity Bodycon Dress with ring detail and get $57 off your purchase. New ASOS discount: Grab Bellfield Straight Leg Vintage Wash Jeans and save $49 on your order from ASOS. Seasonal ASOS deal & sale: Do not miss out this great offer from ASOS to get a discount of $31 on Brave Soul Jersey Zip Shorts. Limited time ASOS coupon: Take advantage of this great offer from ASOS and buy Daisy Street Fold Over Clutch Bag for as low as $26. Limited time ASOS coupon: Make use of this great opportunity from ASOS and buy Super Skinny Joggers pant for men at $43. The ASOS story started in 1999 when Quentin Griffiths and Nick Robertson had the idea of establishing an online platform for shopping clothes with a twist. The ASOS model is aimed to provide customers the experience of dressing up like their favourite celebrities, by finding the kind of clothes they’ve seen them wear. The website went live in 2000 and it has since grown into a global online retailing company. The retailer sells over 80,000 branded products on its online platform, together with its own unique range of clothing items. It’s the place for 20-something fashion fanatics. Furthermore, you should also check out the ASOS range for both men and women. If you want to be inspired by the different looks available on ASOS, check out the As Seen On Me section, together with the similarly named hashtag. The section has inspiring pictures taken by real ASOS clothing users and it’s the best way to be inspired by the latest trends. You might even get your own image on the platform! In addition, if you are looking for a more unique shopping experience, the ASOS Marketplace is worth checking out. You can find amazing independent labels and vintage boutiques from the website and get your hands on some real fashion finds. 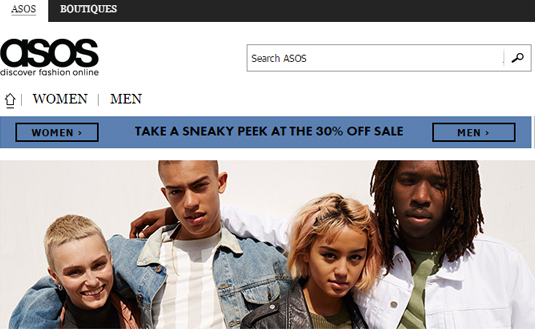 If you are after the top categories, then ASOS is exclusive promoting its own ASOS label for both men and women. You should also check out the New section, which features the hottest additions into the ASOS product family. Finding the right products to buy on the ASOS platform is simple. You can browse the detailed categories or use the search function to find your items. You can narrow down your search based on the style of product you are looking for, as well as the colour you’d enjoy the most. Furthermore, it’s possible to view only a selected number of brands and limit your item range based on price. You may want to check more deals in this category. Simply check out our clothing and accessories section and bang on extra saving. If you are looking to save even more with your fashion purchases, check out the Outlet section. It’s available for both men and women and it’s usually filled with offers of up to 70% off your favourite brands. You can also find Last Chance To Buy products on the Outlet section, which generally have some unique items available, but only for a short time! If you want to go for more options check with Farfetch and French Connection, the global community of over 400 visionary fashion boutiques offering an inspirational shopping experience to fashion-forward consumers. If you’ve been lucky enough to get your hands on ASOS promo codes, using them is straightforward. You can conduct your shopping as usual and enter the promo code details once you are ready to check out. On the Confirm and Pay page, you’ll be greeted by a section stating, “Promo code or Student Code’. Enter the savings code into the box and click Update. Your code should now be added to your order. Remember, you can only use one code per order. It’s easy to spread the joy of shopping on the ASOS website by purchasing a gift voucher. You can order the voucher online and have it delivered to your chosen person. You’re also able to choose the amount you want to gift, but please note the gift vouchers can only be bought and redeemed in British Pound (£). ASOS is the perfect fashion destination for students who love designer clothing. Students receive 10% discount throughout the year on the platform and there are some extra ASOS on Campus perks available. You can sign up online and win a $1,000 ASOS voucher if you pay your deliveries with PayPal. ASOS is a global retailer with a strong international presence. You can visit the ASOS international sites from the UK, the US, France, Germany, Italy, Spain and Russia. You can also view the platform’s prices in your local currency. You can select from three different delivery options when shopping on the platform. The first option is the Australian Standard Delivery. The delivery costs $5, although it is free on orders over $40. The delivery can take up to 5 business days. The second option is the Australian Express Delivery, which takes 3 to 2 business days to deliver. The cost is $10 and free on orders above $125. Finally, you can sign up with a Premium Delivery service, which costs $39 per year. The service charge includes free deliveries, with no minimum value and you can make free returns. If you want to return an item for refund, you need to do so within 28 days of receiving. All returned items will be automatically refunded when you return them, and therefore, you are not able to exchange items. The returns must be made in the original packaging and in good condition; otherwise you might be denied the refund. It can take up to 10 business days for the refund to show up on your account. Be advice that if you received a faulty or incorrect item, you should contact the customer service to sort out the issue. You can find a range of customer support options at ASOS. You should definitely check out the Help section to find buying guides and other customer care options. There, you can find information on the sizing of the ASOS products, as well as tips for ensuring your cloths stay good for longer. Furthermore, you can find support for ordering items, making payments and learn about the different delivery options. Would you like to enjoy over 850 fashion brands in your pocket? 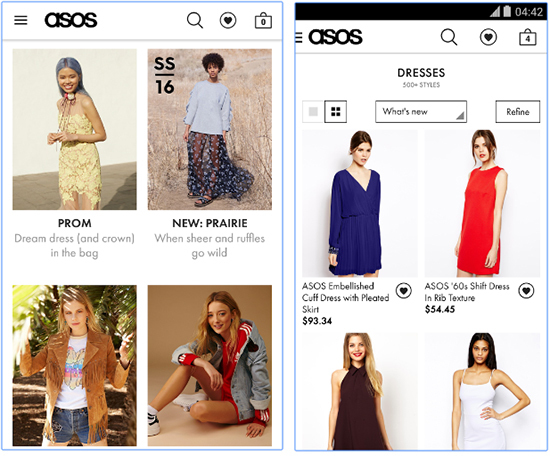 If you want to shop for fashion on the go and learn more about the ASOS sales, then the ASOS Shopping App is something to get. The app is free to download and you can find it from the App Store and Google Play. Furthermore, sign up with the ASOS Style News for fashion-related news. Contact form is available on the website.